In a press statement the US Department of Energy (DOE) said it has completed an environmental assessment clearing the way for the fabrication of high-assay low-enriched uranium (HALEU) fuel for advanced nuclear reactors at the Idaho National Laboratory (INL). A final environmental assessment issued on 01/17/19 determines that there will be no significant impact on the environment from using DOE-owned HALEU stored at INL to fabricate fuel at the laboratory’s Materials and Fuels Complex (MFC), and possibly also at the Idaho Nuclear Technology and Engineering Center (INTEC). The HALEU fuel will be used to support US companies in the development and deployment of new reactor technologies. The DOE’s HALEU is from used fuel from the Experimental Breeder Reactor-II (EBR-II), which operated at the site from 1964 to 1994. 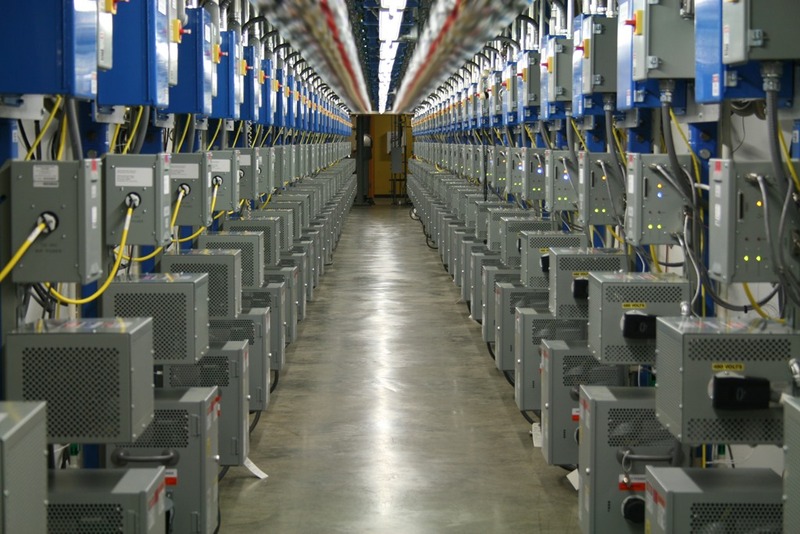 Since 2000, DOE has employed an electrometallurgical treatment process at the MFC to refine and downblend the used high-enriched uranium fuel from the now-decommissioned reactor. About 10 tonnes of HALEU has been produced as a result of this process and is currently stored at INL. Levels of Uranium Enrichment. Image courtesy of Centrus Corp. Many advanced reactor designs currently under development will require HALEU fuel, enriched to between 5% and 20% in fissile uranium-235 (U235). The low-enriched uranium fuel used in today’s nuclear power plants typically contains less than 5% U235. There are at present no commercial facilities in the US that are immediately capable of producing HALEU. However, DOE earlier this month also announced plans to award a $ 115 million sole source contract to a subsidiary of Centrus Energy Corp to demonstrate the production of HALEU using US-origin enrichment technology at the American Centrifuge Plant site in Piketon, Ohio. In its press statement about the Idaho work, DOE said the federal government will fabricate HALEU nuclear fuel at INL from the lab’s HALEU feedstock. This will support near-term research, development and demonstration needs of private-sector developers and government agencies, including advanced reactor developers. This is a finite amount of HALEU with limited applications for specific advanced reactor designs but it is also one of several efforts undertaken by DOE to help ensure the availability of HALEU in support of the U.S. nuclear power industry. The proposed action identified in the environmental assessment calls for establishing the capability at INL to fabricate HALEU ceramic and metallic fuels from the HALEU produced through the electrometallurgical treatment process currently operating at INL, and by using other small quantities of HALEU stored at INL. Most of the HALEU to be used for fuel fabrication results from the processing and treatment of used fuel from the decommissioned EBR-II reactor. Construction and operation of any reactors that propose to use the HALEU fuel will require additional NEPA reviews. In a letter to Perry last week Barrasso wrote that the company had a mixed history in fulfilling federal contracts for nuclear fuel and questioned whether the money it received would end up supporting the Russian state-owned firm TENEX, from which Centrus buys enriched uranium. Photograph of the American Centrifuge 120-machine demonstration cascade, which operated from 2013-2016 at Centrus’ facility in Piketon, Ohio. Image: Centrus file photo. Centrus Energy, a former government-owned contractor, had previously ceased enrichment operations in 2013 before declaring Chapter 11 bankruptcy. The firm has a history of surviving on government handouts and is well-practiced in the art of hiring former high level government officials to promote its interests in Washington. Centrus, now based on Maryland, is the reincarnation of the former United States Enrichment Corp., which was privatized in 1998, and which operated enrichment plants in Ohio and Kentucky until 2013. Barrasso introduced a new wrinkle into the conventional wisdom about the firm’s business pracitces. He raised the issue of whether the DOE contract would actually benefit a Russian firm, TENEX, and not American workers. According to the Houston Chronicle report, in 2017, Centrus counted revenues of less than $200 million, down from more than $1.9 billion in 2012, according to U.S. Securities and Exchange Commission filings. Since then the company’s business has primarily been to import enriched uranium from abroad, including Russia, which is a common practice in the U.S. energy sector. The United States Enrichment Corp operated the Megatons to Megawatts program for a number of years importing blended down highly enriched uranium (80%+ U235) taken from Russian nuclear weapons, which was combined with ordinary uranium, and fabricated it into commercial nuclear fuel (3-5% U235) which was then sold to U.S. nuclear utilities. For several years the program supplied as much as 25-35% of all nuclear fuel used by U.S. nuclear utilities. Even today nuclear plants here get more than 90% of their fuel supply from a combination of global sources including Russia, Canada, and Australia. Canada was and is the largest supplier. DOE justified the sole source contract to Centrus as being necessary despite the fact that it is also investing in a similar capability at the Idaho National Laboratory. What’s interesting is that in both places DOE is leveraging existing stocks of high assay fuels, e.g., greater than 5% U235, that it already has, and for which it had not previously figured out how to deal with these materials. In other words, DOE may have found a solution to a problem that otherwise might have become yet another nuclear waste headache. The $115 million project is actually described by DOE as a small-scale demonstration project with just 16 centrifuges. It will be taking place at the former Portsmouth Gaseous Diffusion Plant in Piketown, Ohio, which was once operated by Centrus. Separately, the government is spending about $18 billion to clean up the site which has been there since it was built as part of the Manhattan Project during World War II. Everett Redmond, a senior technical adviser at the trade group Nuclear Energy Institute, told the Houston Chronicle that the trade group is aware of the Russian connection. “I’ve heard from the Russian companies they can provide it,” he said. Barrasso also disputed DOE’s claim that Centrus has an NRC license to do the work. He said in his letter that Centrus failed to pay the annual fee for that NRC license last year, “as required by law” to maintain its status. Both DOE and Centrus declined to comment to the Houston Chronicle about Barrasso’s letter. Wyoming is one of the key uranium producing states in the U.S. hence the interest of Senator Barrasso in this matter. (WNN) The $18 billion nuclear waste cleanup work taking place at gaseous diffusion uranium enrichment plants at Portsmouth, Ohio and Paducah, Kentucky includes deconversion of depleted uranium from gaseous the powder form. In doing so the process also recovers hydrofluoric acid, which can be used in other industrial processes. Refined acid can even be used to make solar energy cells. Progress reported so far includes the return to service of all seven uranium conversion production lines which enabled the US Department of Energy Office of Environmental Management (EM) to convert over 5000 tonnes of gaseous depleted uranium hexafluoride (DUF6) – more than half its yearly target – to a more stable powder form within the first three months of fiscal 2019. 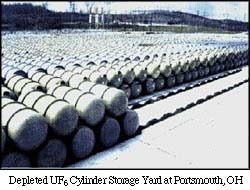 DOE’s 800,000 tonne inventory of depleted UF6 is a legacy of over 60 years of operations at gaseous diffusion uranium enrichment plants at Portsmouth, Ohio and Paducah, Kentucky. The enrichment plants supplied enriched uranium for the early nuclear weapons programs and later for the commercial nuclear energy industry. The Portsmouth plant ceased operations in 2001 and Paducah in 2013. The project has converted more than 70,000 tonnes of the DOE’s inventory since the conversion facilities were commissioned in 2010. “This past year, the DUF6 project implemented facility improvements and operational efficiencies that build a foundation for sustained safe production,” Robert Edwards, manager of EM’s Portsmouth/Paducah Project Office, said. Portsmouth’s DUF6 inventory is expected to be processed in about 18 years and Paducah’s inventory, which is larger, within 30 years. Natural uranium extracted from the ground consists on average of uranium-238 (U238) at 99.3% concentration and uranium-235 (U235) at 0.7% concentration. The uranium-235 component must be enriched to between 3-5% for use in nuclear power reactor fuel in the United States. During enrichment, large quantities of natural uranium (with 0.7% U235) are processed to increase the concentration of U235. The end product is enriched uranium with U235 at 3-5% concentration. The uranium with a higher concentration of U235 (enriched uranium) is used for fabricating fuel for nuclear reactors. During the enrichment process, large quantities of depleted uranium (uranium with 0.2-0.3% U235) or “tails,” are produced. These tails exit the enrichment process as waste in the gaseous or chemical form of uranium hexafluoride (DUF6). These tails are transferred into 14-ton cylinders which are maintained during temporary storage in large yards near the enrichment facilities. See also the NRC information page on uranium deconversion for the chemical engineer elements of the process. (Bloomberg) Rolls-Royce Holdings Plc and its partners are asking the U.K. government for more than 200 million pounds ($264 million) in funding to develop a business that will build small nuclear reactors, according to a report in the Financial Times. The company is seeking a sum “in the low hundreds of millions,” the FT said on Sunday, citing a person familiar with the request. The U.K. is reconsidering its plans to build new plants after Hitachi Ltd. and Toshiba Corp. withdrew from major projects, ending plans for a revival of nuclear power and leaving a significant energy gap in UK plans. Rolls-Royce confirmed to the Financial Times that its consortium was “in discussions with U.K. government officials that we hope could result in a significant joint investment in our power plant design.” Company representatives didn’t immediately respond to an emailed request for comment. (Reuters) Hungary is working to modify financing for a nuclear plant being built by Russia. It wants to delay paying back the loans to build the plant until it is generating electricity, Under the deal, Moscow will build two 1000 MW nuclear reactors to supply electricity. It offered a 10 billion euro ($11.3 billion) state loan to help finance the 12.5 billion euro project. Hungary awarded Russia’s state-owned Rosatom a sole source contract to build the twin 1000 MW VVERs. Reuters reported that construction has faced long delays, partly because of a European Union review of the project, including the way it was funded. “Once we know the deadlines for the technical contract, we will modify this (financing) contract,” said Janos Suli, the minister in charge of the project, told the wire service, adding that this would meet procedures set by the EU executive. After parliament voted to build new nuclear capacity in 2009, Prime Minister Viktor Orban bypassed an international tender and signed an exclusive deal with Russian President Vladimir Putin. Hungary, a former Iron Curtain country, has in recent years been turned back into Russia’s orbit as a result of initiative by PM Orban. The move drew international criticism, especially from the United States, which is concerned about Central and Eastern Europe’s heavy reliance on Russian energy sources. (Bloomberg) Prime Minister Andrej Babis’s ambition to build new nuclear reactors in the Czech Republic is reported to be having an unfavorable effect on CEZ AS’s shares well in advance of any deal to build new nuclear reactors. For almost a decade the state owned utility CEZ has been reluctant to proceed because elected officials haven’t made up their minds about how to finance new nuclear power stations. Bloomberg reports that PM Babis’s administration missed its own end-2018 deadline for a decision on how new reactors should be funded. What’s making investors turn their back on CEZ are the repeated statements by Babis and some of his ministers that the state-controlled utility should pay for the news plants, despite warnings from the management board and shareholders that such a move would trigger lawsuits from investors who hold the remaining 30 percent. “The stock price could be much higher if politicians didn’t constantly annoy investors with this idea,” said Miroslav Frayer, an analyst at Komercni Banka AS in a statement to Bloomberg. The wire service noted that Czech governments have long considered replacing the nation’s old Soviet reactors with new units as being crucial for the country’s energy security. The nuclear push should also help to phase out coal-burning plants and curb carbon emissions. The problem is that power prices remain too low to make such investments commercially viable without a lot of state support, which politicians have refused to provide. The Czech government has repeatedly refused to provide a rate guarantee, loan guarantee, or other financial confidence building mechanisms to promote a deal with a reactor vendor. The numbers associated with the government’s intransigence over rates issues forced CEZ to cancel a tender for new reactors in 2014, after years of price negotiations and legal disputes with potential suppliers. Political conflict and corruption scandals also contributed to the chaotic procurement process. The surge in costs from contracts to completion for new nuclear plants in Finland and France is is also spooking CEZ’s investors. Babis argues that CEZ can afford to build at least one unit at its older Dukovany station, with the government acting as a loan guarantor. The management says that only a fully state-owned entity can fund the investment, estimating the cost of one 1000 MW reactor at at least 150 billion koruna ($6.7 billion), or more than half of CEZ’s market capitalization. Czech parliament is hosting a conference about the future of atomic energy on 2/21/19 with the main speakers being Babis, his ministers of industry and finance, as well as the chiefs of CEZ and the nuclear-safety regulator. Part of the event will be presentations by the six potential suppliers of new reactors, including CGN, Areva, Atmea, Westinghouse, Kepco/KHNP, and Rosatom.